Doll's Musings: A Snowflake to Love and Winner!!! Thank you all for your lovely comments on my last few posts. I am finally finished reports, save for one complex report. I was on a roll yesterday but it had snowed and I wanted to take a walk along the river, so that's what I did! It is so cold here but beautiful. I will take this over rain any day. Nothing worse than having to commute with bags and umbrellas and fighting with the wind. Anyhow, I did do a wee bit of crafting at night which I will show after I show you what my dear friend Vickie sent to me when I told her about Little Bean. 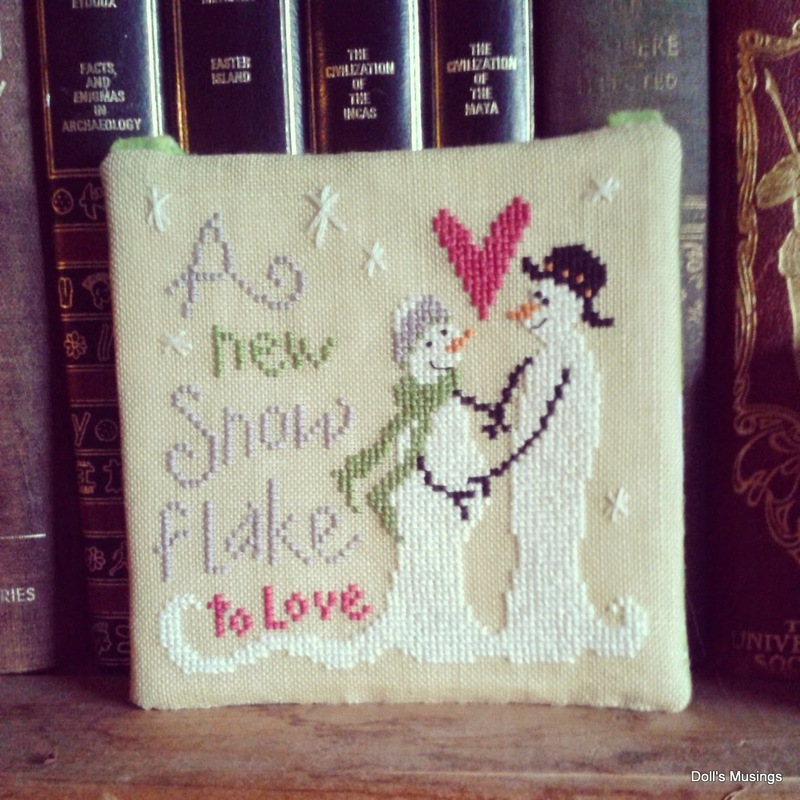 She stitched the cutest ornament for us that I can't wait to put on our tree. Isn't it the sweetest ornament?!! Thank you so much Vickie dear! We will put it up every year on our tree and tell Little Bean all about it. I also got a few more rows crocheted in my granny stripe which I have abandoned for awhile. Titus had to step in to model for all of you. See how he's eying the string?! Then I finished Sarah Chapple's vase, which is just so beautiful. I'm going to stitch the other one then work on the 1 over 1 butterflies that are around the vases. I did try to stitch on the PS Santa ornament last night but I decided to cut the fabric which was really silly because I cut it without taking into account the stick he's holding so either I will rip it out or leave the stick out. My hubby asked why I would do such a thing...I don't know why I make my life more difficult for myself, I just do. Oh well. I did the random generator thingy and the number came up 26, which was Maggee's comment number. I couldn't take a photo of it for the life of me so if anyone knows how to do that, let me know for the next time!! I'll be contacting you Maggee to get your info and send you the GC tomorrow after school. Thank you all for participating!! I wish I could give out more!! That pic of the leaves with the snow is wonderful! I love the ornie Vickie sent you -- it's perfect, and so thoughtful! She is a sweetie! Love your granny stripe! I'm thinking about trying my hand at one too, but we shall see. I need to re-learn crochet first. lol! Titus is a cutie! Mia stares at the yarn as I'm knitting too. lol! You can see her wanting to play with it, but she's a good girl for me. Glad the worst of the reports are done! Take good care of yourself and the little bean! That ornament is just perfect! How sweet of Vickie to make such a wonderful gift. 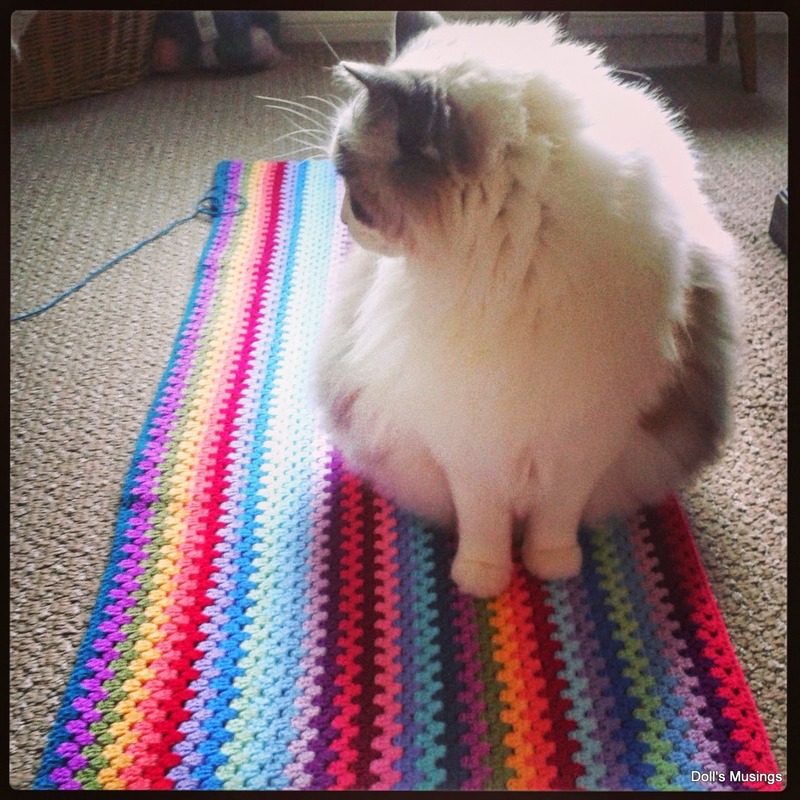 Love your blanket, it's really coming along and such wonderful colours too. Congrats to Maggee! Such a cute gift from Vickie. Lovely blanket, and nice progress on the sampler. A very beautiful and thoughtful ornament. Titus look quite impressed with his new blanket, cat fur is the new thread to attach to it!!! Congrats to Maggie!! What an adorable ornament, so precious. A walk in the snow sounds wonderful to me! Temps here have gotten near 60 & it's going to stay that way for at least a week. Bah! Humbug! Love the photo of Titus eyeing that string of yarn : ) Keeping you & baby in my prayers! Your gift from Vickie is so sweet. Lovely stitching and I hope Titus helps with the crochet! Titus looks so nice on your great looking granny stripe. I know you will come up with something for that PS Santa. AND Lee will love it. I am praying for you three every day! Still in awe with your little blanket :) Great ornament from Vickie, it looks just so sweet!! What a sweet gift from Vickie - and the snow and leaves picture - lovely. Adorable ornament Anne. Your granny stripe is lovely. Your stitching is beautiful. Love the pic of the snow in the leaves. What a sweet and thoughtful gift from Vickie! I love how Sarah C is looking. I want to make her my 2015 project! Your granny stripe is looking great. That was so thoughtful of Vickie to send you that sweet ornie! Great job on your blanket and Sarah's vase. The colors are so pretty. Such a perfect ornament for the three of you, Anne. How kind of Vickie to stitch that for you--she did a great job. what is that the cutest ornament you got.. it's really awesome!!! you have snow.. I'm so jealours!! I want it, sent me some please!!! What a cute ornament! !Hope you are feeling well! Beautiful gift from Vickie! That is the cutest ornament! Love the blanket your making. The colors are fantastic. I truly thank you for having the Giveaway! 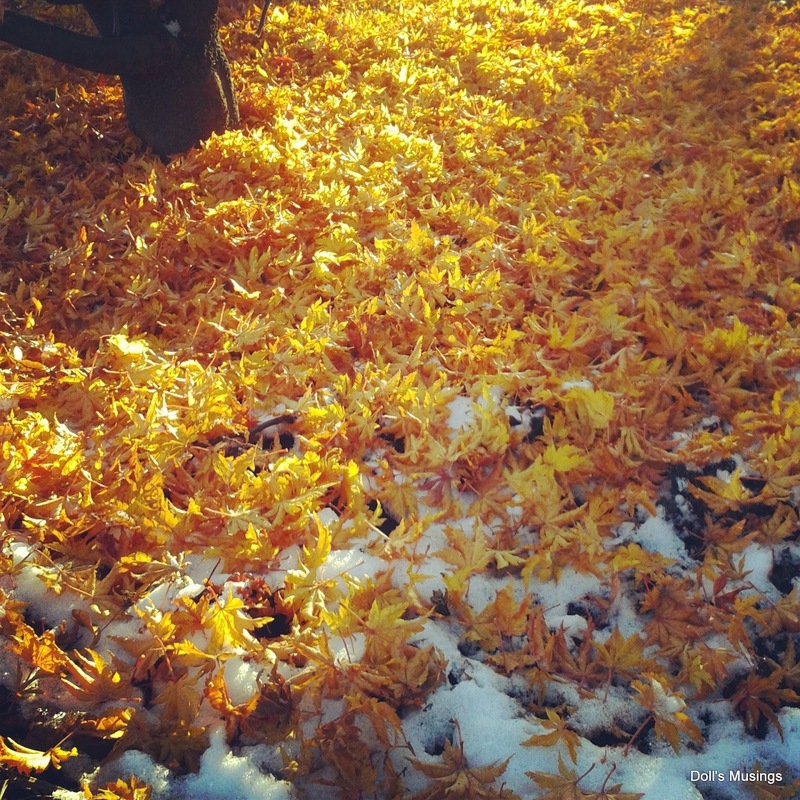 Love that picture of the leaves and snow... very striking! Your Sarah Chapple piece is coming along nicely. You always pick great projects to stitch! Big Hugs! I dunno if you're a Windows user or a Mac user so have both instructions! On Windows, to take a picture, you want to do a print screen! Hold down the ALT key and press the PrtScn key (usually the upper-right of your keyboard). It will take a picture of whatever is open on your screen so you can paste it into whatever image viewing program you use on your computer. If my random blather isn't clear enough, just google "how to print screen mac/windows" and surely someone has made a better tutorial that me ahaha. The ornament is just perfect! I love your blanket, it has wonderful colours. I love Sarah's vase - well done on finishing her! Your winter pic is lovely! All that lovely snow.... even if it is a bit too cold for me to handle! What a wonderful gift from Vickie. SO cute! Your WIP is gorgeous and I love your granny stripe blanket. Love the photo of the leaves in the snow. Vickie's ornie is so cute! I have wanted to stitch it for someone since I first saw it! This year's mag had the baby hanging the star on the tree, I wonder if next year's will be a little toddler snow child and we will follow the family grow! The Ornie is so cute! Your projects are looking lovely, especially Sarah. 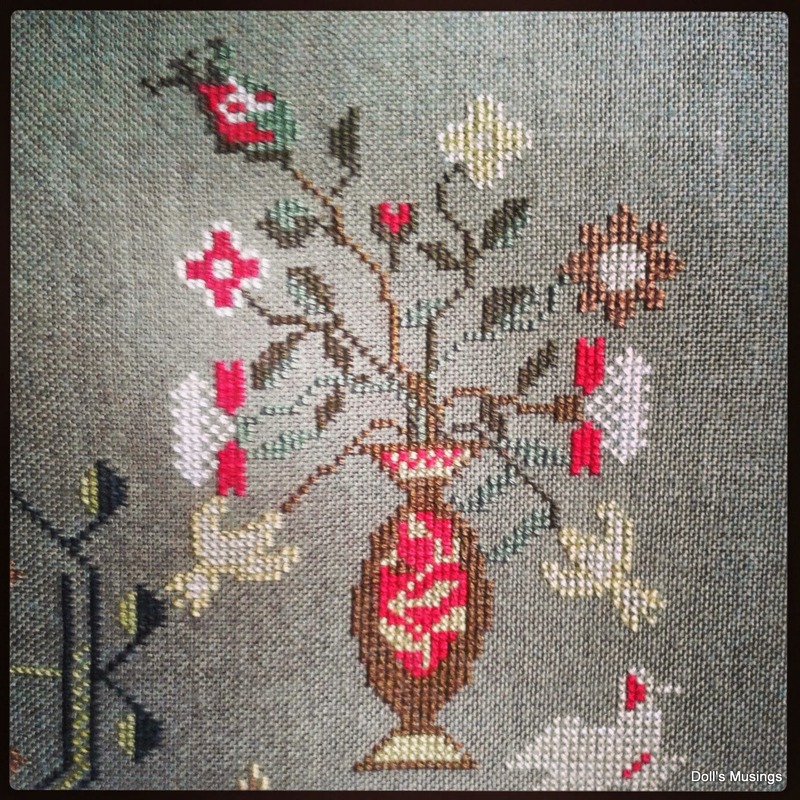 That ornament is so cute :) Great progress on your sampler and blanket too! Such a cute ornament from Vickie. So glad to hear that your reports are done and that you and Little Bean are doing well. That is such an adorable ornament!